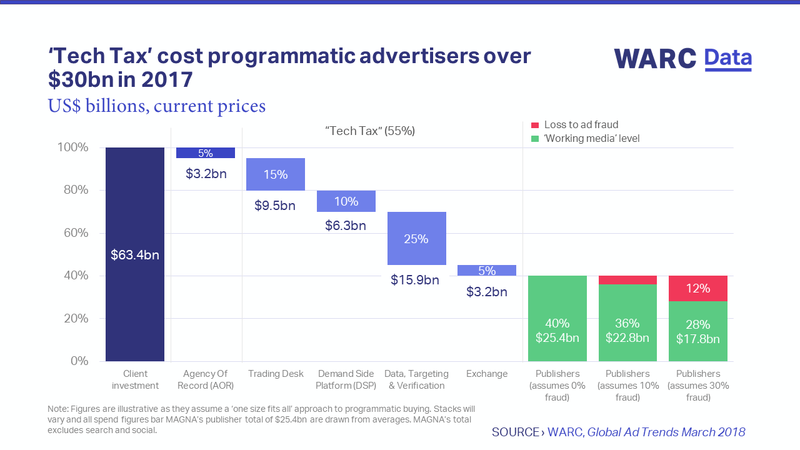 GLOBAL: As little as 28% of advertisers’ programmatic expenditure may actually make it to the working media level, as agency fees, the “tech tax” and ad fraud all eat into the $63.4bn spent worldwide last year, an analysis by WARC shows. Programmatic’s role in ad trade is increasing rapidly: two in every five dollars (39%) spent on advertising in the US last year – across all media and formats – were traded by machines. This rate has doubled over the last five years. The latest monthly Global Ad Trends report focuses on threats to the digital advertising ecosystem as a result, and highlights the concerns of senior marketers around social media risks, where a significant number of accounts are fake or duplicates, and reputation management, with four in ten marketers having had problems after ads appeared next to objectionable content. Ad fraud and ad viewability also cause anxiety. On average, one in three clicks on programmatic ads across all sizes and platforms is fraudulent, while only one in four viewable desktop ads is actually seen. And media buying transparency and accountability form another area where marketers worry that their money is not necessarily being spent effectively. A murkier area is the supply chain, the various elements of which – trading desks, demand-side platforms, exchanges and the processes of data, targeting and verification – constitute the so-called “tech tax”. Taken together, these account for 55% of programmatic spending, or $34.9bn. The true figure, however, is likely to be closer to $30bn, as platforms where the tech is integrated (such as YouTube’s Trueview) cloud the calculation. And if one assumes the level of ad fraud stands at 30%, then another 12% of programmatic spending is lost, meaning that only $17.8bn of the $63.4bn invested actually goes to working media. “The boom in programmatic advertising over recent years has exposed major flaws in the ecosystem, including heightened brand risk, impression and click fraud, and poor viewability and dwell time,” said James McDonald, Data Editor, WARC. This report summarises the latest research from WARC's Data platform, with a focus on threats to the digital advertising ecosystem. An overview of click fraud rates among programmatic ads by size and platform.